Criminal domestic violence charges are common in Gilbert, AZ. When a romantic partner, family member, or roommate calls the police, Gilbert dispatch sends police officers to respond to the domestic disturbance. Gilbert police investigate the scene and separate parties to record their respective statements with body-worn cameras. Gilbert officers rarely see the domestic incident, and as such, they sometimes charge the wrong person or make an arrest where no crime was committed. After an arrest or criminal citation, Gilbert prosecutors take it from there; and they’ll continue to prosecute even when a victim wants charges dropped. While prosecutors might consider victim input, it’s not up to the victim on whether to make a deal or dismiss charges. Dismissals and plea agreements are in the discretion of the prosecutor; and are only subject to approval by a Judge. Tobin Law Office Offers Knowledgeable and Experienced Criminal Defense in Domestic Violence Cases in the Courts that Serve Gilbert, Arizona. Arizona’s domestic violence laws can be harsh and confusing. That’s why it’s important to discuss your case with a Gilbert criminal defense attorney, who can protect your rights and future. 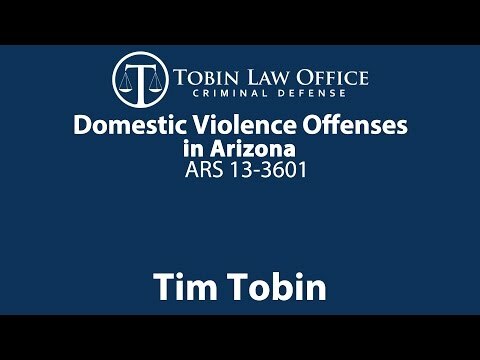 Defense attorney Tim Tobin is a former Gilbert prosecutor (assigned to Highland Justice Court) with years of experience defending clients against domestic violence allegations. Domestic Violence Courts Servicing Gilbert, Arizona. Most of Gilbert’s domestic violence cases are investigated by Gilbert Police Department. Misdemeanor domestic violence charges are filed in the Gilbert Municipal Court. In limited instances, a domestic violence matter might be referred to Highland Justice Court. If Gilbert police charges you with felony or aggravated domestic violence, your case will likely be in the Mesa Superior Court or the Superior Court in downtown Phoenix. What is a Gilbert, Arizona domestic violence charge? Domestic violence, by itself, isn’t a criminal charge; it’s an extra allegation that exposes a Defendant to harsher—and sometimes mandatory—penalties. A domestic violence allegation states that the victim is domestically related to the defendant. Arizona’s definition of a domestic relationship includes spouses, romantic partners, relatives, in-laws, and roommates. It’s a broad and inclusive category; if there’s any family, romantic, or household relationship, law enforcement will treat it as a domestic violence case. The domestic violence allegation carries harsh penalties, including a lengthy domestic violence program, the loss of firearm rights, child custody and divorce implications, and a criminal record that’s accessible to employers, agencies, and financial institutions. Additionally, a domestic violence allegation can sometimes elevate a misdemeanor to a felony. What types of crimes can be charged with a domestic violence allegation? Arizona’s domestic violence statute lists all the crimes that can come with a domestic violence allegation. Common domestic violence charges include threatening or intimidating, ARS 13-1202; assault, ARS 13-1203; aggravated domestic violence, ARS 13-3601.02; aggravated assault, ARS 13-1204; unlawful imprisonment, ARS 13-1303; criminal trespass; criminal damage, ARS 13-1602; interfering with judicial proceedings, ARS 13-2810; disorderly conduct, ARS 13-2904; and preventing use of telephone in emergency, ARS 13-2915. Gilbert, Arizona’s Domestic Violence Penalties and Consequences. An Arizona domestic violence conviction carries several lasting consequences. First, it leaves a criminal record that cannot be expunged. In addition, the judgment impacts gun rights, custody disputes, employment and financial applications. For these reasons, when charged with domestic violence in Gilbert, Arizona, it’s crucial that you consult a Gilbert criminal defense lawyer who’s experienced in domestic violence charges, Arizona courts, and agencies involved in Gilbert’s domestic violence cases. Arizona’s domestic violence penalties can vary considerably depending on the factual circumstances and Defendant’s criminal history. To understand potential penalties, first determine whether the case is in a felony or misdemeanor court. If it’s in a city, municipal, or justice court, you face misdemeanor charges. If instead, it’s in Superior Court, you’re facing at least one felony. Below we address potential penalties for misdemeanors and felonies separately. Lastly, we address collateral consequences in any domestic violence case. Maximum penalties in misdemeanor domestic violence cases. Gilbert’s misdemeanor domestic violence penalties depend upon the misdemeanor’s classification. Class 1 Misdemeanor: Up to 180 days in jail, $4,575.00, and three years probation. Class 2 Misdemeanor: Up to 120 days in jail, $1,372.50, and two years probation. Class 3 Misdemeanor: Up to 30 days in jail, $915.00, and one year probation. Mandatory Domestic Violence Treatment Pursuant to A.R.S. 13-3601.01. Those convicted of a misdemeanor domestic violence allegation must complete a domestic violence offender treatment program, which takes at least 26 weeks, and as much as 52 weeks. The defendant must pay for the treatment, but sometimes health insurance can pay for it. Failure to complete all the treatment classes can result in additional penalties imposed by the judge. The Gilbert Municipal Court sends Defendants to Gilbert Youth and Adult Resources for domestic violence counseling. Penalties in Gilbert’s Felony Domestic Violence Cases. Felony and aggravated domestic violence penalties depend on the felony classification and the defendant’s criminal history. A felony conviction can result in anywhere from probation to many years in state prison. Even worse, if you’re charged with aggravated domestic violence, under ARS 13-3601.02, there’s a minimum of four months in jail. Aggravated domestic violence applies to a defendant who has at least two prior domestic violence convictions in the seven years. The seven years is measured by the offense dates. Aggravated domestic violence carries a mandatory four months jail. If you have three prior convictions within seven years, the mandatory minimum jail increases to eight months. And these are merely minimum penalties. Aggravated domestic violence is a class five felony, which carries up to two and a half years in prison. If you have a felony record, you can face as much as seven and a half years in prison. Collateral Consequences to Domestic Violence Convictions. Permanent Criminal Conviction: Domestic violence convictions show up on background checks. Loss of Gun Rights: Federal law prohibits firearm possession and ownership for anyone convicted of a felony or domestic violence offense. Child Custody and Divorce: A domestic violence conviction can be used against you in in a divorce or custody case. Employment: Employers in competitive fields are reluctant to hire employees with a domestic violence conviction. If employment involves firearm usage, a domestic violence conviction might cost someone their job. Immigration: A domestic violence conviction might hurt immigration or legal status. Gilbert’s deferred judgment diversion may help avoid a criminal conviction. For some Defendants, domestic violence diversion can be negotiated by their attorney. Gilbert’s Domestic violence diversion involves paying program and probation fees and completing domestic violence counseling through Gilbert Youth and Adult Resources, which is located inside the Gilbert Police Department. If successfully completed, the deferred judgment plea is set aside and the case is dismissed. Domestic violence diversion is in the sole discretion of the prosecutor. Your defense attorney can explain to the prosecutor why you’re a deserving candidate for diversion. Many factors weigh into the prosecutor’s decision on whether to permit diversion. Diversion is often a desired outcome because it can avoid the conviction and collateral consequences. Nevertheless, if it’s apparent the State cannot prove the case, it might be wiser to reject diversion and fight the charges through trial. A skilled defense attorney can explain these options during representation. The Town of Gilbert Prosecutor’s Office has a domestic violence deferred prosecution program under A.R.S. 9-500.22. With this particular diversion, the Gilbert judge accepts the plea, but doesn’t enter a judgment or conviction. The judge instructs the Defendant to start the prosecutor’s diversion. If the program is timely completed, the case is completely dismissed and the guilty plea is set aside. The Court’s release conditions may prevent you from returning home or seeing loved ones. Gilbert judges often won’t let you return home or contact the victim while your case is pending. For obvious reasons, this causes disruption and inconvenience to the family. Gilbert Judges do this in the abundance of caution. An experienced Gilbert criminal lawyer can file a motion to modify your release conditions to allow you to return home and have contact with the alleged victim. Whether the judge grants a modification depends upon the underlying facts, victim input, and prosecutor’s position. Gilbert prosecutors almost always object to changing release conditions. In Gilbert cases, it’s helpful if you seek marital counseling separately. Modifications to release conditions are more likely when the underlying allegations are minor and there’s a lack of violent history. A Gilbert criminal attorney can help you restore gun rights. Even after a domestic violence conviction, a Gilbert defense lawyer can file a motion to set aside the judgment. The set aside law is found under ARS 13-907. A set aside motion cannot be filed until the Defendant completes sentencing terms. If the judge sets the conviction aside, federal law would no longer prevent firearm possession. Affordable Payments and Flat Fee Representation: Mr. Tobin provides an effective and knowledgeable defense at a flat rate with no surprise costs or charges. Former Prosecutor: Attorney Tobin is a former prosecutor, which offers valuable insight to the opposing prosecutor’s approach to the case. Excellent Communication and Personal Attention: Mr. Tobin handles all aspects of your domestic violence case. Clients of Tobin Law Office have Mr. Tobin direct cell phone and email for quick correspondence. Domestic Violence Consultations are Free: Contact us and you’ll be put in direct contact with Mr. Tobin to discuss your case and have questions answered fast. Attend court dates for you so you don’t miss work or family commitments. File motions to return home. Negotiate dismissal, deferred judgment, or reduction. If necessary, fight the domestic violence charges at trial. 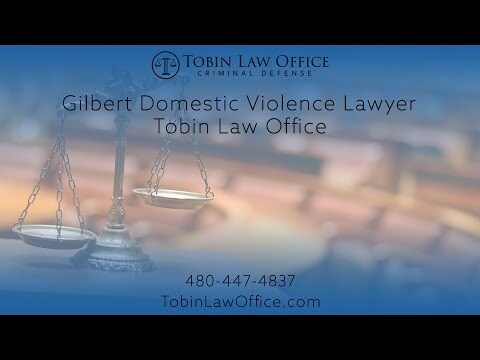 Call or Message Tobin Law Office for a Free Consultation on Gilbert Domestic Violence Charges.